Got old paint? With a little imagination, you can create a new home piece. If you’re sitting on a stash of leftover latex paint, you have a gold mine when it comes to home decorating. With a little imagination and creative flair, you can use paint leftovers to give your home extra appeal, and have lots of fun in the process. Want to give it a go? Here are 10 great ideas, courtesy of the Paint Quality Institute. Try one, try all, or better yet, try something that’s yours alone. Regardless, you’ll be surprised at the way forgotten paint can infuse new life into your home interior. Make kitchen items kitschy. It takes only a little leftover paint to impart canisters, coasters, or the handles of wooden spoons and spatulas with bright, fun color that can make cooking more joyful. Colorize some flowerpots. In the same way, planters and flowerpots can be decorated with paint color — the more, the merrier. Paint them one solid color, or embellish them with pattern for more panache! Dress up a dresser. Have an old dresser that’s tired-looking? Spice it up with paint. Use different colors on different parts for added visual interest. Do the same with an old stool, table, or cabinet. Rejuvenate “junk” furniture. Check out your attic or your neighbors’ discards. You might find hidden treasure in the form of a unique piece just pining for a fresh coat of paint. Put a stamp on your walls. Add pizzazz to painted walls with a handcrafted patterned border. Fashion a “stamp” out of an old sponge in the pattern of your choice, then dip it in the leftover paint and dab new color onto the walls. Voila! Custom design. Speak with an accent. Express your home’s individuality by adding accent color to a door, doorway, or an entire wall. 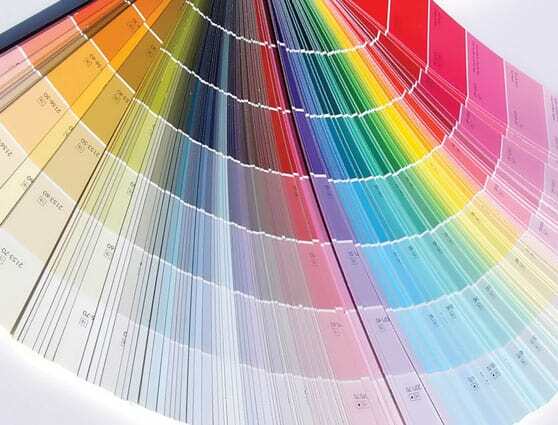 The unexpected color will make your interior something special. Beautify a built-in. Embellish built-in bookcases, cabinets, or a mantelpiece with leftover paint to create striking elements in your décor. Stencil something. Using a homemade or commercial stencil, apply paint to just about anything – a piece of furniture, a wall, or even the floor. It can render the ordinary, extraordinary. Make like an artist. Why buy art supplies, when you already have a handpicked palette of colors you like? Use them as is, or mix them as needed to create murals or fine art. Frame your artwork. Repaint the frames on your prints, paintings, and drawings to give them a fresh appearance. Or, paint a simulated “frame” right on the wall to draw attention to favorite objects or sculpture. Most of these projects take just a small amount of paint, but they can make a big difference in your home décor. For how-to information on these and other paint projects, visit blog.paintquality.com.